Biography: Dr. P was born into a Hindu family in Chennai and Vasantha was born into a Hindu family who became Christians in the�neighboring Indian state of Kerala. In 1966 Dr. P's father was healed of throat cancer when Presbyterian Christians came and prayed for him. As a result of this miracle, his father was born again. The family was baptized, but Dr. P did not become a believer until 1969. In 1975 he graduated from South India Biblical Seminary, and in 1978 he graduated from Hindustan Bible Institute. At this time he married Vasantha, and they began street preaching and singing in Chennai. From this start came India Calvary Ministries. In 1992 they built a building for Calvary Baptist Church. 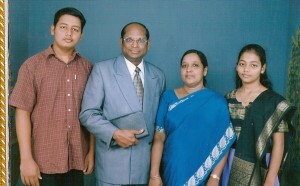 In 1997 Dr. P received a vision to plant 1000 churches across India. To accomplish this goal, in 1998 he began Calvary Baptist Bible College as a ministry of ICM where after graduation, young men commit to starting 10 churches in their lifetime. Dr. P has said, "It takes miracles to win Hindus," and believes fervently in displaying the power of God as a witness to them. Perumal and Vasantha are called father and mother by many of the Christians in the 130 churches birthed through their vision. They oversee and encourage the 26 pastors who care for the churches. Their Vacation Bible Schools draw hundreds of�Hindu children to hear the Gospel. Dr. P and Vasantha sing together in an active music ministry in the Tamil language. In 2007 they began an orphanage which has taken street boys who lost their parents in the Tsunami of 2004. Strengths: Dr. P is a fervent evangelist and has greatly inspired many with his vision of winning India to the Lord, and is a good guitar player. Vasantha is also a great preacher and a favorite singer among the Tamil people. Family: Dr. P and Vasantha have 2 adult children, Joshua and Joy Jennifer.